The WHO notes that Non-Communicable Diseases (NCDs) kill about 15 million people between the ages of 30 and 69 years globally. Out of all premature deaths, 85% occur in low and middle-income countries and cancers are the second-leading cause of it, killing about 9 million people. Therefore, early detection and prompt response to NCDs are important to curb these deaths. 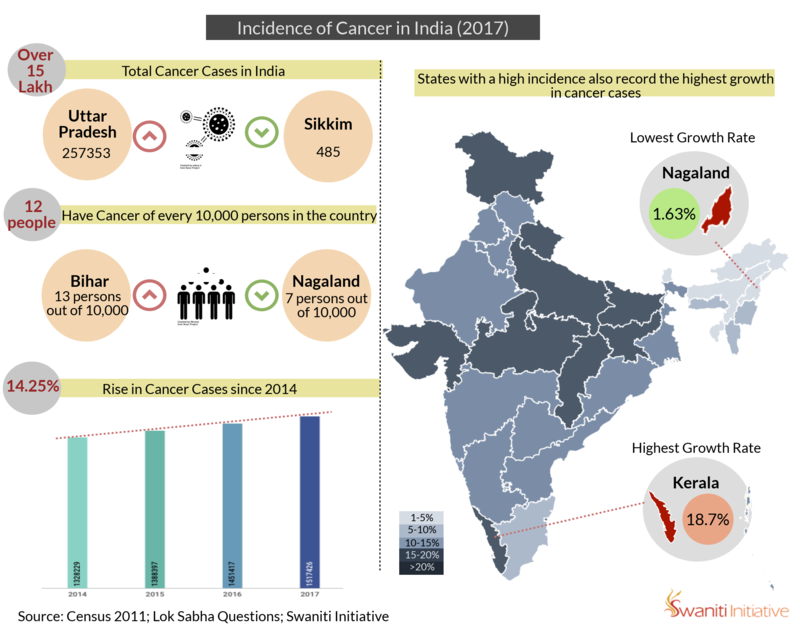 In this context, it is useful to examine the prevalence of cancer in India and take stock of the efficacy of response systems designed for checking the spread of this disease. As the first infographic on cancer incidence shows, Uttar Pradesh leads in the number of cases registered, at 2.57 lakhs, while Sikkim has the lowest number of cases, at 485 in the year 2017. 12 out of every 10,000 Indians are affected by some form of cancer or the other with Bihar registering the highest prevalence rate in the population at 13 persons per 10,000. Nagaland has the least prevalence rate, at 7 people per 10,000 affected by cancer. This is not an isolated case; over the years, there has been a steady rise in cancer prevalence in India. Between 2014 and 2017, the rate of growth was 14.25% nationally. Among the states, Kerala has witnessed the highest rate of growth of cancer at 18.7% while Nagaland has registered the lowest rate, at 1.63%. None of the states have registered a decrease in the rate. The WHO identifies that detection, screening and treatment, as well as palliative care, are important aspects of responding to NCDs. Cancers are no different from other NCDs in this regard. The pictogram sheds light on the state-wise burden of cancer care in India. It shows that states with high cancer prevalence also have a high patient burden, as evidenced by the case of Bihar. 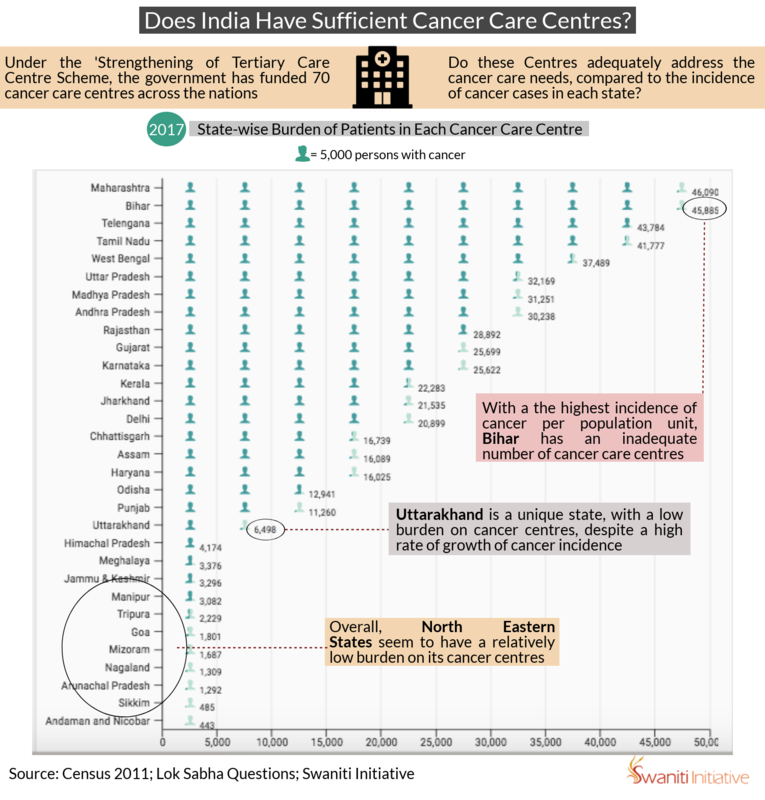 The North Eastern states appear to have a lower burden on their cancer care centres while Uttarakhand stands out as an exception, with a relatively lower burden despite a high prevalence of cancer.